As towns in Maryland go, Forest Hill is fairly young. It’s a suburban community set along the outskirts of Bel Air, which itself sits so far north of Baltimore that you can find plenty of commuters who head northeast to Wilmington, Delaware instead. With so many new houses, you wouldn’t expect much call for foundation repair Forest Hill. After all, while it’s hard to stop concrete from weakening over time or stop the surrounding soil from putting pressure on basement walls, both these issues normally take decades to become a problem. However, the first few years are also a critical period when it comes to your foundation and other aspects of the house. We like to think that the people who build our homes are perfect at their jobs, and that they get enough oversight to catch any mistakes before they become permanent features, corners still sometimes get cut and mistakes still sometimes get made. This is especially true during housing booms, when everyone is racing to keep up with a big spike in demand. As a result, a construction company might not use the best materials available, or they might not finish every task before moving on to the next one. For instance, beneath the foundation slab of every modern home is a layer of heavy gravel, gravel that allows water to flow through as fast as possible and into perforated pipes that lead to the local storm drain network. This layer can easily take the weight of the foundation and the house that stands on top of it, but first the construction team needs to compact the gravel properly. If they don’t, the gravel will settle unevenly when the full weight of the house presses down on it, and that will cause the foundation slab itself to settle unevenly. 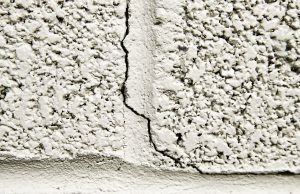 Whether your house is old or new, if you suspect the foundation in your home is beginning to settle, there are several warning signs you can check for. • The doors in your house, particularly the exterior doors, are hitting the doorjamb instead of closing properly. • Diagonal cracks are beginning to form at the corners of door and window frames. • The floors are no longer level. • You can see gaps between wall-to-wall carpets and the wall. • Cabinets and drawers won’t stay closed. • Wrinkles are forming in the wallpaper or paint. Any one of these signs is reason enough to start worrying, but they also aren’t proof that your foundation slab is settling. Someone could have installed a door incorrectly in the first place, making it hard to close, and a wrinkle on a piece of wallpaper could just be a mistake on someone’s part. As such, you should wait for several symptoms to appear and get a professional appraisal before you make any final decisions. There are plenty of home improvement projects out there that anyone can do with a little training and a good set of instructions, but when it comes to a major foundation repair in Forest Hill or elsewhere in Bel Air, it’s usually best to leave it to the experts. • Slabjacking. This is a particularly colorful name for a fairly straightforward process: the contractor will pump a mixture of grout or concrete underneath where a foundation slab has settled downwards, basically “jacking” the slab back up to its proper position the same way a carjack can lift a car’s wheel off the ground. • Piering. This method gets its name from the way people pound posts into a lakebed in order to hold up a dock or pier. Similar to that, piering involves pounding metal posts into the ground until they either hit bedrock or simply get deep enough to make no difference. Once that’s happened, the contractor will attach the posts to the foundation slab with steel to hold it up indefinitely. If you need a an expert in foundation repair for Forest Hill or any other community in or around the state of Maryland, you should contact AA Action Waterproofing. With three decades of experience, we know all the ins and outs of basements, foundations, and crawlspaces, and since our initial estimate is free, you’ve got nothing to lose by looking us up.